The DS W2 is an optical phono cartridge system costing $13,000 | What Hi-Fi? A turntable with a laser is right at home at CES in Las Vegas. 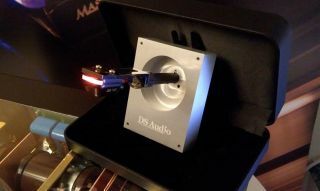 DS Audio has put a tech twist on the turntable with the launch of a new optical cartridge, which uses a beam of laser light rather than electrical power to track your vinyl record. The DS W2 cartridge comes with its own W2 preamp, too. OK, so optical connections have actually been around for 30 years now, but only DS Audio has seen fit to use one on a turntable cartridge. And hey, a laser sounds cool. Following the launch of the world's first optical cartridge back in 2015, and a successor last year, the company has shown off a whole new system, the DS W2, at CES 2018. So, why? The company claims the removal of the magnet and coil - and the magnetic field - helps deliver a more stable, better-sounding cartridge. It's also lighter, at just 8.1g. DS Audio claims the position and structure of the device has also been adjusted and improved, all, naturally, with the aim of delivering better sound. The cartridge has an aluminium chassis, with a boron cantilever design and a Micro-Ridge stylus, which also helps to keep downward force to a minimum. DS Audio recommends a 1.7g tracking force. The DS W2 also gets its own preamp, the DS W2 premamp, which comes complete with an updated, isolated (and massive) power supply, and a circuit board that promises a short and clean signal path. There are both RCA and XLR balanced outputs. Intrigued? You better start saving. The DS W2 cartridge costs $4500 and the preamp is $8500.